1. Avoid extension cords. They can be more trouble than they’re worth, causing your child to trip, tangle, or worse. If extension cords are a must, invest in an electrical cord shortener to keep cords under control, and out of kids’ hands. They’re easy to use and keep your cords under wraps at all times. 2. Consider tamper-resistant receptacles where possible. These outlets are designed to be baby-proof. Unless you’re actively plugging something in, and pressure is applied into the socket from two prongs at the same time, the outlet stays closed. Little ones are quick but they aren’t very coordinated, so they’ll be locked out of these devices by default. 3. Cover those outlets. Chances are, you’re not utilizing every single outlet in your home. That means tiny fingers and small objects can (and will) make their way into electrical outlet openings that are left unprotected. Especially if you don’t have tamper-resistant receptacles, plug every exposed outlet with a plastic outlet cover for protection. The covers can be quickly removed by an adult, but thankfully, they’re designed to be almost impossible for children to budge. 4. Play a hiding game with wires. 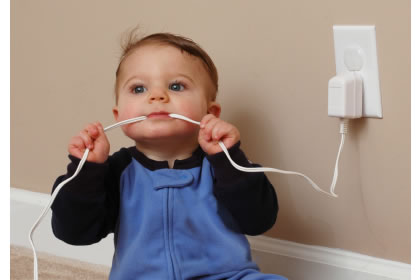 To little ones, wires look like lots of fun to play with, pull, and even chew. Avoid this temptation by keeping wires out of reach or hiding them behind furniture. Wires put your child at risk of strangulation, shock, or worse. 5. Protect your power strips. What looks like even more fun than something plugged into a wall? A bunch of things plugged into a power strip, right on the floor where it’s even easier to touch, of course! If you must use a power strip, invest in a child-proof power strip cover to keep little ones from messing with the outlets. These covers can be quickly affixed and locked onto any standard power strip for your peace-of-mind. Being proactive about home safety allows you to focus on the most important things in your life.